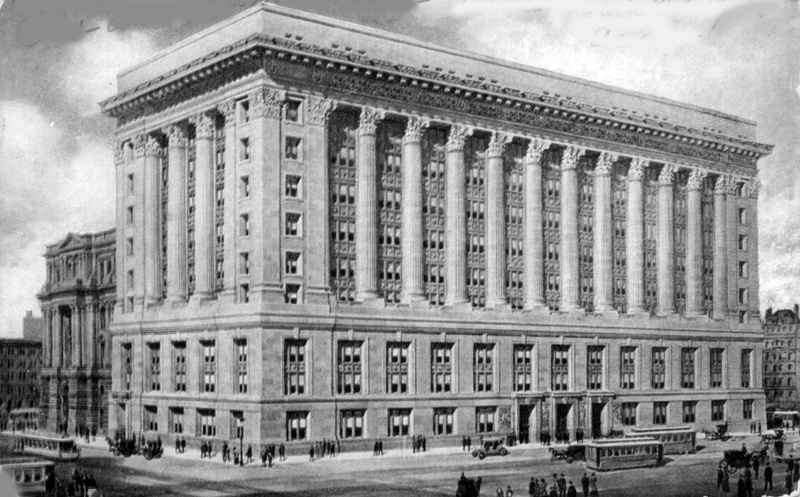 Chicago has had seven courthouses since her birth in 1837 and all resided on or near the same block. Leading citizens of Chicago met in the Saloon Building for the purpose of preliminary action in procuring city charter. The building’s name was synonymous with the French “salon” a grand and spacious hall. In May, 1837, the City Common Council leased space in the Saloon Building for their own purpose, and for accommodation of the Municipal Court. This was the first City Hall, and the structure stood on the southeast corner of Lake and Clark streets, and was erected in 1836 by Captain J. B. F. Russell and G. W. Doan. At that time it was not only the finest hall in Chicago, but was not eclipsed by anything of the kind in the West. In this hall on Monday evening, January 23, 1837, the meeting of a few of the leading citizens of the town was held, for the purpose of preliminary action in procuring a city charter. It was also devoted to public entertainments of various kinds, political and religious meetings, concerts, traveling shows,etc. The name of this hall would to the casual reader, appear to connect it with a house of no very good repute; but such an impression would he erroneous. The word ” saloon ” as applied to this edifice had a very different meaning from what it now has. Its use was synonymous with the French salon, which means literally a grand and spacious hall. Upon expiration of the lease in the Saloon Building, the city government moved to leased space in Mrs. Nancy Chapman’s building at the northeast corner of LaSalle and Randolph Streets. Old Market Hall was erected by the city. 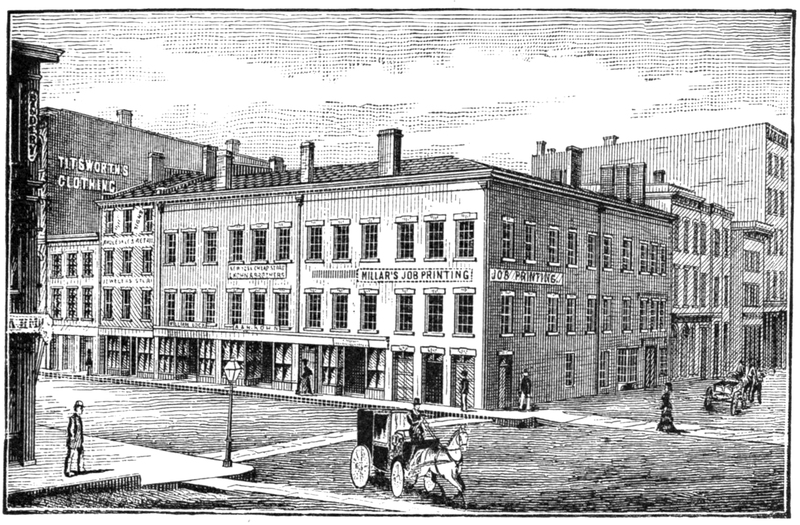 The first municipal structure, this two-story building located in the center of State Street, fronting forty feet on Randolph Street and running north one hundred and eighty feet toward Lake Street, contained 32 public market stails on the first floor and city offices on the second floor. In January, 1848, the Market Building on State Street was erected by the city, and was the first municipal structure, the Common Council having heretofore rented their accommodations. The building was situated in the center of State Street, fronting forty feet on Randolph and running north toward Lake Street one hundred and eighty feet. It was built of brick and stone, two stories in height. The first floor was laid out into thirty-two public market stails. The second story was divided into four rooms, the one in the north end twenty by forty feet, ) arranged for a library, and the south room for the City Clerk’s office. The center rooms, divided by a partition, with folding doors, one forty by seventy-two feet, the other forty by sixty-eight feet, were used by the Common Council and for other public purposes. The entire cost was $11,070. J. M. Van Osdel was the architect and superintendent. The Common Council occupied their new rooms for the first time November 13, 1848. The City Common Council and County decided that one structure to be occupied jointly should be erected in the center of the public square, bounded by LaSalle, Washington, Clark and Randolph Streets. 1851 – Construction was started in September. 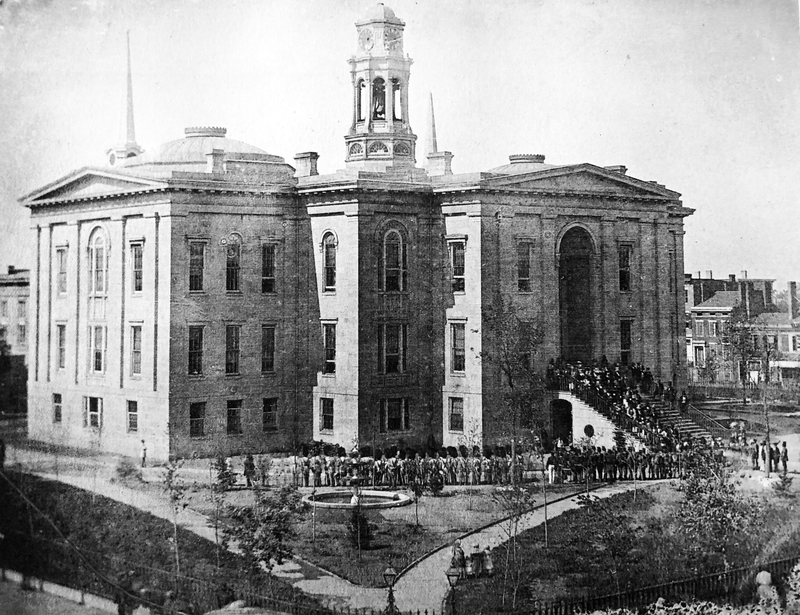 1853 – Completion and occupancy of the new structure. 1858 – Third floor and dome added to original building. 1869 – East and west wings added to original building. New City Hall at the southeast corner of Adams and LaSalle Streets was completed and occupied by the city government. 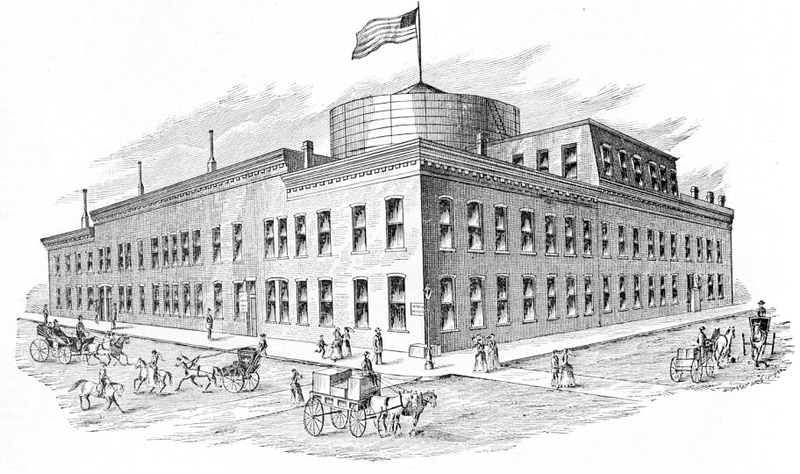 This two-story brick building, hastily constructed around a large elevated water tank., was known as “Old Rookery” and served as City Hall until 1885. For $50,000 and other considerations, the County of Cook granted to the City of Chicago the irrovocable right of occupancy “henceforth and forever” of the west half of Block 39 Original Town of Chicago, pro- vided same shall be occupied by the City for purposes of City Hall, (the block bounded by LaSalle, Washington, Clark and Randolph Streets). City and County jointly advertised for plans for a new City Hall and County Building. 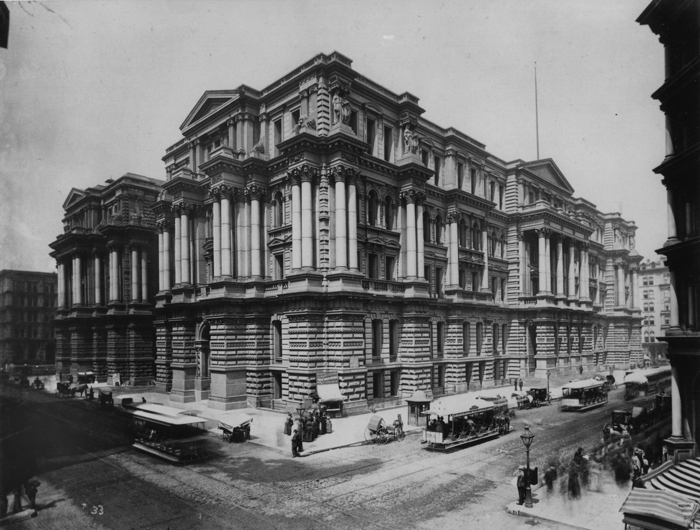 1885 – Completion and occupancy of City Hall and County Building. 1897 – The right of the City to occupy the west half of Block 39 Original Town of Chicago for purposes of City Hall upheld by Illinois Supreme Court. As soon as the building was finished, its limitations became evident. The interior with its high ceilings, small windows, oddly sized rooms, and long, drafty, dark corridors made for inconvenience and discomfort. Secondly, because the building had been under construction for so long, it was already overcrowded before it was finished, and some employees had to be moved into rented space. The inadequacies of the recently opened buildings made it evident that consideration must be given to the need for a new city hall and a new county building. The city didn’t actually have the money to replace it, though, since they’d just blown about $100 million in current dollars on the mess. 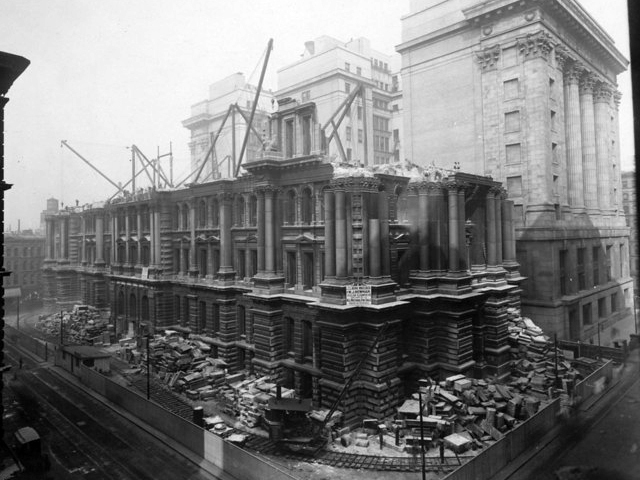 Fortunately or something, in 1905 the building sank six inches, causing a gas pipe to rupture, which created an explosion that blew the roof off the building. That gave the city an excuse to build a proper city hall, and the county moved in to its half of the building by 1907. Holabird & Roche, Architects, awarded contract for design and planning of Cook County Building.